As they say, Hispanic is not a race. Latin Americans are a three-way mix of Europeans (from Spain), Native American Indians, and Sub-Saharan Africans, but proportions of these genetic components vary a lot both between and within different groups. We find that the most likely source of the indigenous ancestry in Caribbean islanders is a Native South American component shared among coastal tribes from Venezuela, Central America, and the Yucatan peninsula, suggesting extensive gene flow across the Caribbean in pre-Columbian times. We find evidence of two pulses of African migration. The first pulse — which today is reflected by shorter, older ancestry tracts — consists of a genetic component more similar to coastal West African regions involved in early stages of the trans-Atlantic slave trade. The second pulse — reflected by longer, younger tracts — is more similar to present-day West-Central African populations, supporting historical records of later transatlantic deportation. Surprisingly, we also identify a Latino-specific European component that has significantly diverged from its parental Iberian source populations, presumably as a result of small European founder population size. 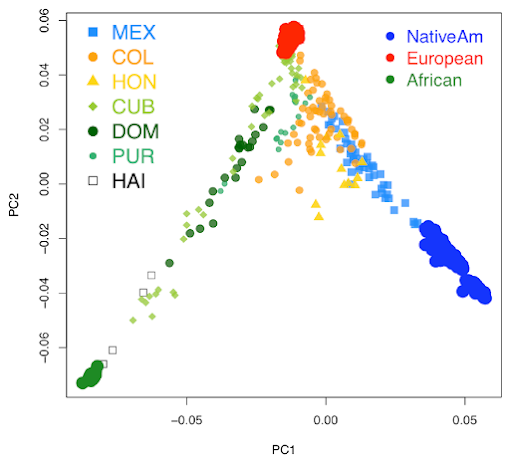 Figure 1B shows the distribution in PCA space of each individual, recapitulating clustering patterns previously observed in Hispanic/Latino populations: Mexicans cluster largely between European and Native American components, Colombians and Puerto Ricans show three-way admixture, and Dominicans principally cluster between the African and European components. Ours is the first study to characterize genomic patterns of variation from (1) Hondurans, which we show have a higher proportion of African ancestry than Mexicans, (2) Cubans, which show extreme variation in ancestry proportions ranging from 2% to 78% West African ancestry, and (3) Haitians, which showed the largest average proportion of West African ancestry (84%). Assuming a K=3 admixture model, population admixture patterns are driven by continental reference samples with no continental subdivision (Figure 1C, top panel). However, higher Ks show substantial substructure in all three continental components. [...] At K=8, when the clinal gradient of differentiation between Southern and Northern Europeans appears, the Latino European component is seen only in low proportions in individuals from Portugal and Spain, whereas it is the major European component among Latinos (Figure 1C, bottom panel). ADMIXTURE clustering analysis using the high-density dataset containing approximately 390K autosomal SNP loci in common across admixed and reference panel populations. Unsupervised models assuming K=3 and K=8 ancestral clusters are shown. At K=3, Caribbean admixed populations show extensive variation in continental ancestry proportions among and within groups. At K=8, sub-continental components show differential proportions in recently admixed individuals. A Latino-specific European component accounts for the majority of the European ancestry among Caribbean Latinos and is exclusively shared with Iberian populations within Europe. Notably, this component is different from the two main gradients of ancestry differentiating southern from northern Europeans. Native Venezuelan components are present in higher proportions in admixed Colombians, Hondurans, and native Mayans. Moreno-Estrada et al. "Reconstructing the Population Genetic History of the Caribbean". PLOS Genetics, 2013. © 2004-2018 Racial Reality. Powered by Blogger.